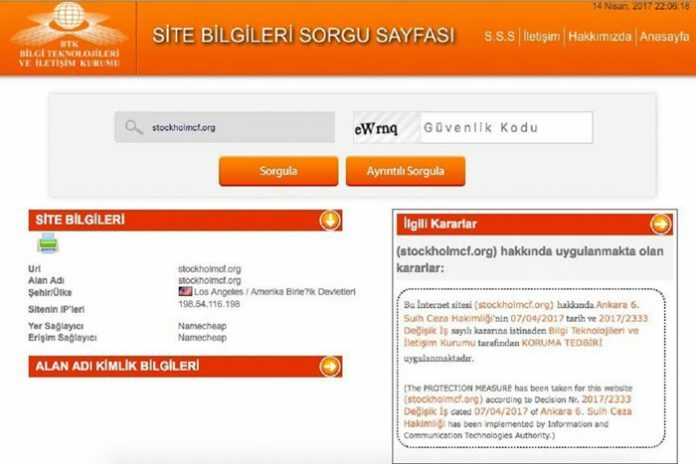 An Ankara court has ruled to block the website of the Stockholm Center for Freedom, an advocacy organization that promotes the rule of law, democracy and fundamental rights and freedoms, SCF has reported. SCF was, according to its bio, set up by a group of journalists who have been forced to live in self-exile in Sweden against the background of a massive crackdown on press freedom in Turkey in January, this year. Internet freedom in Turkey was rated “not free” in the 2016 Freedom on the Net report by Freedom House, a downgrade from its previous “partly free” status. The report also noted that the Turkish government frequently targets political opponents by applying the country’s draconian defamation laws. Over 100,000 social media accounts and websites are currently blocked or banned in the country. According to Twitter’s latest government transparency report, updated twice a year, the Turkish government made 493 requests for account information and 2,232 requests to remove accounts or content in the second half of 2016, marking 76 percent and 25 percent increase, respectively, from the first half of 2016. Yaman Akdeniz, an associate professor of law at Istanbul Bilgi University’s faculty of law tweeted on Friday that “on the eve of the referendum on Sunday, there is increase in censorship on the Internet.” He also attached a screenshot of the blocked SCF website to his tweet. Akdeniz also shared a judge’s order that blocked access to 46 links of news stories critical of Turkey’s autocratic President Recep Tayyip Erdogan. Moreover, a Diyarbakır court ruled to block 132 social media posts and web links that are related to the pro-Kurdish Peoples’ Democratic Party’s (HDP) “no” campaign in an upcoming referendum. This article originally appeared in Turkish Minute on Apr 15.